College Counseling for Admissions Professionals is a much-needed resource to guide college admissions professionals in helping students navigate the college choice process. This research-based book prepares college admissions professionals to not only be marketers of their institution, but also disseminators of knowledge about the college choice process. Arguing that the most effective retention tool for an institution is to provide prospective students with the best possible information to choose the right institution, College Counseling for Admissions Professionals provides the full set of tools that every college admission professional needs today to ensure students applying to their institutions are making informed choices and will more likely achieve success while in college. This volume empowers admissions counselors with the knowledge, insights, best practices, and resources to understand their role more broadly in order to better serve the needs of students, providing a solid foundation upon which to build their professional admissions career. "College Counseling for Admissions Professionals provides admissions and access professionals with a comprehensive analysis of research evidence and action strategies, providing new counselors with a comprehensive overview of the field and seasoned administrators with guidance for actions aimed at improving and expanding educational opportunity. It is a must read!" "An outstanding read for college admissions officers regardless of their number of years of experience or institution type. We are reminded of our responsibility to students and their families in helping them make informed, well-researched college decisions. Persistence and graduation are of great import and often not considered in the "match" or "fit" discussion. I can imagine this book will be read widely by admissions officers as a reminder of why our work is vitally important to the students with whom we work." "By reimagining the traditional role of admissions counselors, these authors offer a fresh look at how these professionals can work most collaboratively with their K12 counterparts—school counselors and pre-college advisors. This enlightened perspective and the workable recommendations offered will position admissions counselors as leaders among a wide network of college access professionals. 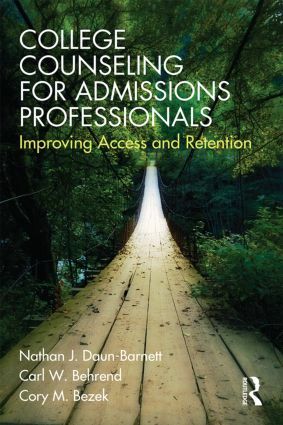 I applaud the authors for re-conceiving the admissions counselor role and especially for doing so in a way that aligns it with those who work with students on the other side of the admissions table." Nathan J. Daun-Barnett is an Assistant Professor of Higher Education Administration in the Educational Leadership and Policy Program at the University at Buffalo, USA. Carl W. Behrend is a retired school counselor, former chair of the guidance department at Orchard Park High School and founder of Behrend Consulting in Buffalo, New York, USA. Cory M. Bezek is Assistant Director of Admissions at the State University of New York at Fredonia, USA.